Goldsun Focus Media is Vietnam’s leading OOH (out-of-home) media firm. It was founded in 2006 by Goldsun, a well-known Vietnamese advertising agency and Focus Media Group Shanghai (FMCN – NASDAQ), through an exclusive license to operate OOH media businesses in Vietnam. The company provides advertising over LCD/LED screens in buildings, supermarkets and other high traffic public places. More than 5000 LCD screens have already been installed around the country in supermarkets such as Big C, CoopMart and LotteMart and in 450 different office buildings and commercial locations. 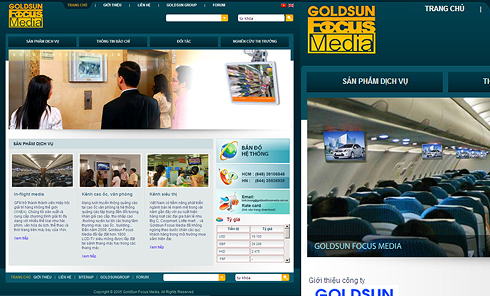 Goldsun Focus also delivers in-flight media for Vietnam Airlines.